Mitsubishi Motors Corporation - Japanese carmaker, which produces passenger cars, SUVs, vans, buses, trucks. The company's headquarters is located in Tokyo. The history of "Mitsubishi" begins in 1970, when a large industrial group Mitsubishi Heavy Industries spun off and became an independent company avtostroitelnaya Mitsubishi Motors Corporation. The first cars were produced machine-building post office shipping company - Mitsubishi Mail Steamship Company, founded in 1873, which was a Japanese businessman Yataro Iwasaki. Car Mitsubishi Model-A stayed on the line for four years (from 1917 to 1921. ), After which the company from the issue of passenger cars declined due to very low demand. Manufacturing changed its production of buses and trucks. Since 1960, Japan's rapid economic growth begins, significantly increased demand for vehicles, and the company "Mitsubishi" begins to design and build a passenger car. The first post-war car company was a small car for the mass market Mitsubishi 500, gained much popularity due to its low cost and reliability. In the years 1961-65 produced consistently model Mitsubishi 360, the first four-seater minicar Minica, then the passenger Colt model 600, Debonair and Colt Model 800. It was more than comfortable family cars. In 1969, the presentation of the model Colt Galant, which has absorbed all of the most advanced achievements in the field of art and design. In the same year the car Colt F2-C won the race "JAF Grand Prix Formula Car Race". Thus, in the 1960s in Japan, there are models, who later became the founders of the popular families - Colt and Galant. On the automotive brand Mitsubishi world learned in the early 1970s, when the company released the model Galant and Lancer and entered the international market with them. "Mitsubishi" greatly increased the distribution network, and Mitsubishi automobiles are increasingly began to appear on roads around the world. Mitsubishi Galant is available Mitsubishi Motors since 1969. Created nine different generations of this model, total sales now exceed five million cars. The model started as a compact sedan, but over time has become a medium-sized car. Since 1994, the cars assembled at the plant in Illinois were sold in the US market. Initially Mitsubishi Galant was one of the modifications of the Colt model, and was a small car of classical configuration with a 1.5-liter engine and dependent spring rear suspension. The first generation of Mitsubishi Lancer (A70) was first released in February 1973. In North America, this car called the Dodge Colt, and in Europe - Colt Lancer. 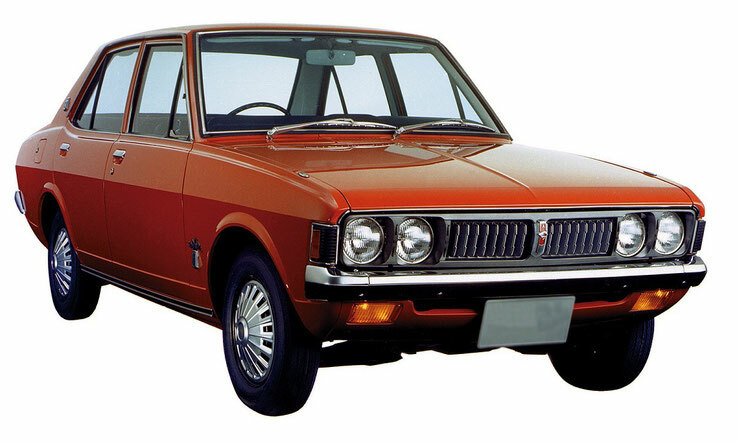 First Lancer had three types of body: two-door sedan, five-door and four-door station wagon. Engines in various embodiments, different volume: 1.2 liter, 1.4 liter and 1.6 liter. Sport model Mitsubishi Lancer GSR 1600 successfully participated in many sports competitions, winning the Safari Rally twice and the Southern Cross Rally four times. In 1975, the Lancer lineup was complemented by a compartment called the Mitsubishi Lancer Celeste. In 1978, the company "Mitsubishi" launches the second generation Mitsubishi Colt, a compact city car mostly in the back of a hatchback. 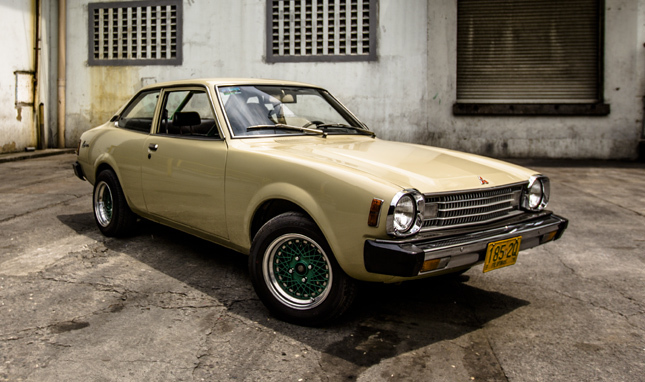 The first generation, introduced in 1962 as a two-door sedan Mitsubishi Colt 600, had a classic layout, but in 1978 changed to the front-wheel drive, all-wheel drive and later added modifications. Cars Mitsubishi Colt completed with four-cylinder engine capacity of 1.5 liters and 81 hp (60 kV). Under the brand Mitsubishi Colt in different years were issued, sedans, station wagons, fastback, however, the main body is still the hatchback. In 1979 model Mitsubishi Colt 1400 GLX received the prize "Car of the Year" in the class of medium-sized cars. In 1979, to replace the first generation comes new car Mitsubishi Lanser, and in the next, 1980, the company "Mitsubishi" is entering the market with four-wheel drive off-road model pickup truck Mitsubishi L 200 4WD. Modern model (2006) is implemented in a number of countries under the name Mitsubishi Triton. Performed in versions with two-door two-seat, two-door and four-door five-seat four persons (Double Cab) cabin. Depending on the configuration, it can be equipped with air conditioning, sound system, automatic or manual transmission, four-wheel drive Easy Select, or Super Select, electronic locking rear differential, ESP stability control. The first SUV Pajero series (in Spanish-speaking countries it is sold as Montero) was presented to the company "Mitsubishi" in 1982. The first went on sale a short three-door version with a petrol (2.6 liter) and diesel (2.3 liter) engines. In June 1984 Pajero was further refined. Diesel engines with turbocharging became even more powerful model with a longer wheelbase got disc brakes on all wheels as standard equipment. In January 1983, only a year after the start of production, the Pajero entered the world of motorsport. Pajero cars won several prizes at the Paris-Dakar rally, including the team cup. In Russia, this SUV is more known for modifications in 1991 and 2000 (five-door version) s. Pajero was awarded many prizes in many countries of the world. 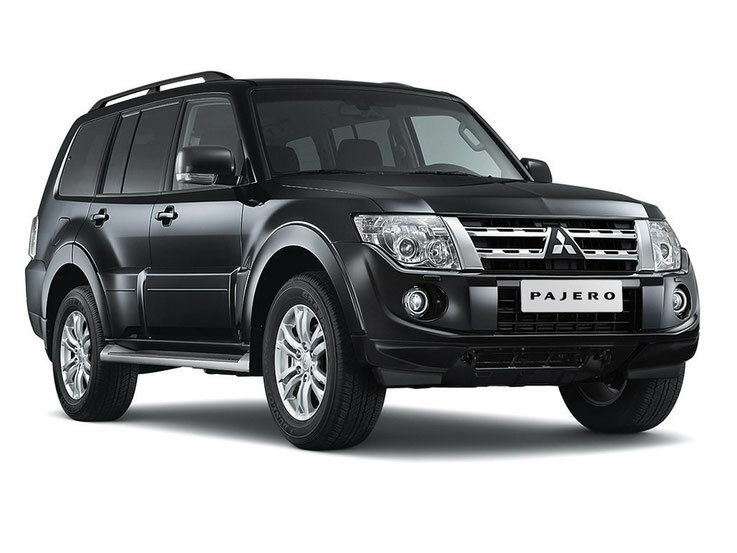 In 1986, the Pajero named SUV of the year in the UK (UK's What Car). Since 1983, Mitsubishi cars were equipped with electronic suspension system, and in the same year, the release of the versatile Spase Wagon was launched. In 1984, Mitsubishi Corporation became the official supplier of cars for the Olympic Games in Sarajevo, and in 1987 - for the Universiade in Zagreb. 1988 - new model Colt and Lancer won the race in Germany. Galant VR-4 model has been recognized by the "Japan Car of the Year" in 1987-88. The 1980s were a decade of Mitsubishi's global expansion in the world markets. In addition, in this decade it has been created various assembly plants outside of Japan, including a joint venture with Chrysler Corporation in Bloomington, USA. Car Mitsubishi Diamante (Sigma) off the line in 1989. It produces a type of bodywork sedan and wagon, while already since the release of the car is positioned as belonging to the business class. Produced for the markets of different countries, including for domestic. Mitsubishi Eclipse - Quadruple (2 + 2) sports car with coupe and convertible. Available since 1989, and only in the LHD version. Named in honor of the English horse of the XVIII century, winning 26 races. In the US, the same was sold under the names Eagle Talon and Plymouth Laser. 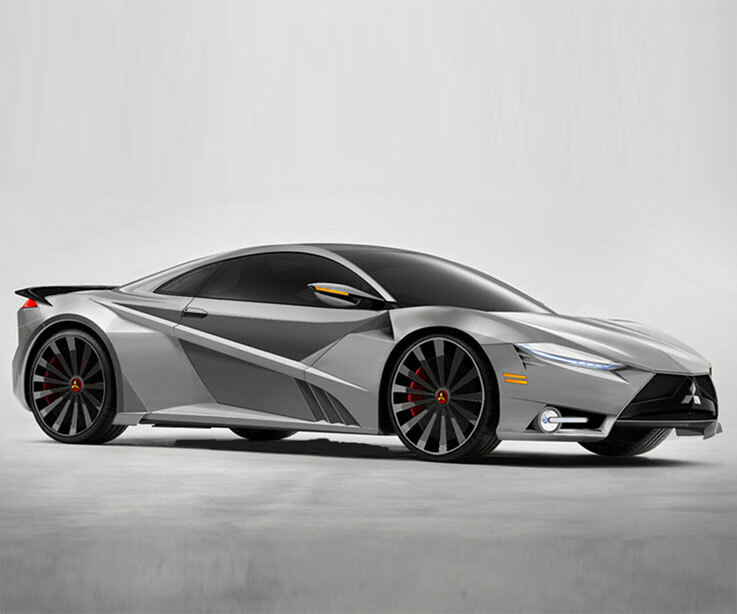 The car is equipped with an engine Mitsubishi 6G75 (3,8 liters), allowing the car to accelerate to 100 km / h in 6.2 seconds. and reach speeds of 200 km / h (electronically limited). Sports car class GT Mitsubishi 3000GT was produced from 1990 to 2000. In the domestic market of Japan it has been known as the Mitsubishi GTO. For North America, the car was going to Chrysler Corporation under the name Dodge Stealth. This car company Mitsubishi used its most advanced technologies, such as four-wheel drive, four-wheel active, active aerodynamics featuring automatic adjustment of the front and rear spoilers and electronic control suspension (ECS). On the machine was installed engine DOHC 24v V6 power of 164 kW (223 hp) at 6000 rev / min. 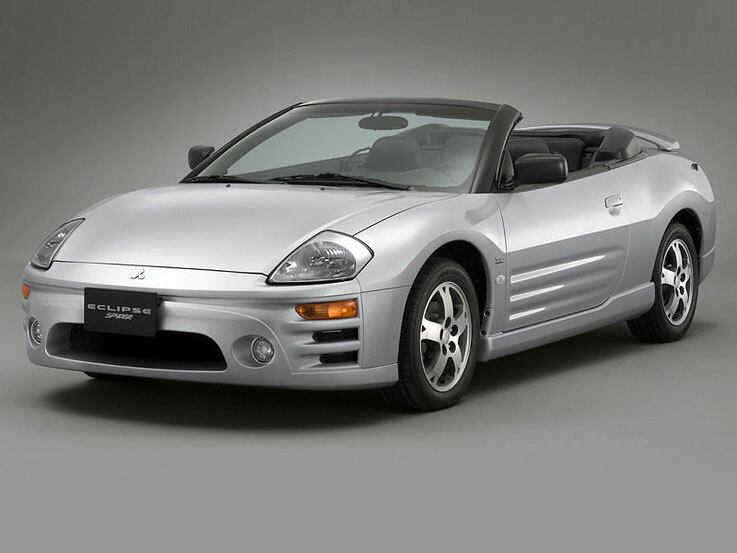 Mitsubishi 3000GT comes in two body styles - a 2-door coupe and convertible. In March 1995, he debuted Mitsubishi Lancer VIII (eighth generation). From the available body was only a sedan, coupe, and even offered in some markets. Standard equipment was the driver airbag, passenger airbag and offered for a fee. In Europe, the "eighth" the Lancer forced to compete with slightly larger sedan Mitsubishi Carisma (joint model "Mitsubishi" and "for sale" companies), whose production at a plant in the Netherlands was established in the same year. European buyers were offered two petrol motors in volume of 1,3 and 1,6 l. In other countries, the choice of powertrains has been much wider. In the same 1995 it was released a representative of "Lancer" series of sports options - Mitsubishi Lancer Evolution III. Third Evolution made in the same package as the first two the Evo, but has improved aerodynamics, increased engine power to 270 hp at 6250 rev / min. And for acceleration to 100 km / h it took only 4.9 seconds. All these improvements have allowed Evolution III to achieve great success in the World Rally Championship. In 1996 Tommi Mäkinen at the wheel of Evolution III became the champion of WRC and Mitsubishi secured the second place in the constructors' championship. In August 1996, there was "Galant" in the eighth generation, characterized by predatory, sporty design. The appearance and the direction of the contours of the body parts have earned the model the nickname "Shark". He offered in sedan and station wagon. In Japan, the wagon was sold under the brand Mitsubishi Legnum. Updated Mitsubishi Galant VIII won again in Japan 1996-1997, the title of Car of the Year. VR-4 version is equipped with a 2.5 liter V6 engine with two turbochargers, developing 280 hp Since 1998, "Galante" were equipped with engines with direct petrol injection GDI. Sports Mitsubishi Lancer once again was upgraded in 1999. The updated Mitsubishi Lancer Evolution VI changed body dimensions fog lamps, cooling system (there was a large oil cooler) and the piston of the engine group, as well as other vehicle mechanisms. As a result, the engine power increased to 330 hp (246 kW), enabling the Finnish rally driver Tommi Mäkinen win for Mitsubishi four WRC racing championship. Mitsubishi Colt sixth generation in the different markets offered from 1,1-, 1,3-, and 1,5-liter petrol engine. These motors are manufactured in the factory MDC Power (Germany), belonging to the corporation DaimlerChrysler. Also, in some countries, there are commercially available versions of a diesel motor. The most common version of the modern Mitsubishi Colt in the European market is a car with a 1.3-liter 95-horsepower 16-valve petrol engine. Transmission 5-speed or robotised 6-speed (developed by Getrag). All-wheel drive modification exist in the Japanese market. Also in the new century it began the production of a mid-sized crossover Mitsubishi Outlander, which in 2005 acquired a modern look. Outlander name means "journey to the distant unexplored lands in search of adventure." The second-generation Mitsubishi Outlander platform based on the new GS, and had several engines, not only from of Mitsubishi, but also from Volkswagen and PSA Peugeot Citroën. Automobiles Citroën C-Crosser and Peugeot 4007 are rebedzhirovannymi versions of Mitsubishi Outlander (replacing the brand). From the iconic cars of "Mitsubishi", created in the new century, it is worth noting minivan Mitsubishi Grandis, manufactured in 6- and 7-seater versions. December 28, 2007 the company Mitsubishi Motors signed an agreement on the conditions of the industrial assembly of cars in Russia. In 2010, production was started at the plant, which was built near Kaluga in cooperation Mitsubishi Motors and France's PSA Peugeot Citroën. By the fall of 2010 the company produced models such as the Citroen C4, the crossover Mitsubishi Outlander and his counterpart titled Citroen C-Crosser. In the first years of the new millennium (2002) started the production of current Mitsubishi Colt hatchback sixth generation, which is going in the Netherlands and Japan. Mitsubishi Colt VI refers to the B-segment on the European classification and features a large five-seater saloon height. The standard hatchback boot volume is 220 liters (VDA standard) when shifted forward rear seat space increases to 315 liters and with full remote second row seats luggage compartment volume of up to 645 liters.